This morning we welcomed Nellie to Fort Fido. 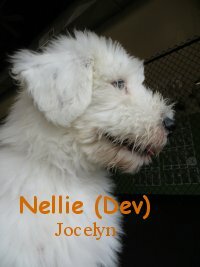 Nellie is an 3-month old, 15 pound, Old English Sheepdog. As Nellie entered Fort Fido, she knew that this was a place to enjoy herself at. She delightfully entered into The Fort with confidence and excitement. Soon after entering the medium roll, Nellie began to cheerfully socialize with the other pups. She enjoyed her time here at Fort Fido and we look forward to seeing Nellie return for some more fun.